I hope everyone had a great day celebrating fathers/grandfathers/father figures, etc. 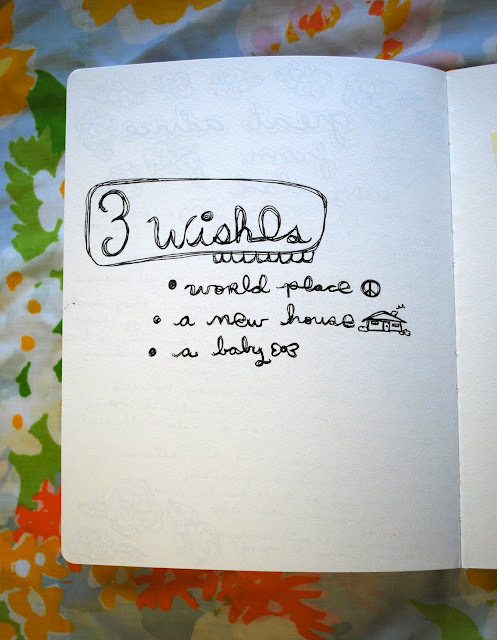 Journal Prompt: If you had 3 wishes today, what would they be? These can be silly wishes, heartfelt wishes, deep desires, or practical wishes. If you had 3 wishes right now, what would you ask for? My wishes are BIG ones :) These are all things that I wish I could have with the snap of a finger! The sentiment is simple but the wishes are HUGE. I really love this page! I am having such fun with this challenge, thanks for doing it. I finally got around to posting some of my pages on my blog.